Summer is here with a vengeance in the Overberg. The harvest has been gathered in and it is a time that after the whirlwind craziness of spring that most botanists will be tucked away in their cool offices or taking a well earnt break. The heat is intense and to the untrained eye the veld looks dry and dull with little to see. Surprisingly, in the Renosterveld of the Overberg there are a few plants defying the extreme summer conditions in the hopes of finding a mate. If you happen to be a plant and are rooted to one spot, you do this by attracting pollinators. Braving the summer heat comes with an important advantage: If you flower now there is far less competition for the insects’ attention than is the case during the busy spring months. 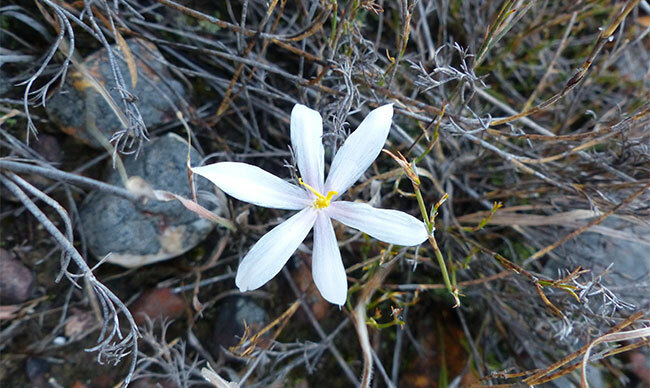 Here we take a closer look at a few of the summer bloomers of Overberg Renosterveld. The genus Apodolirion is something of an enigma. Despite its relatively early discovery by Thunberg in the early 1770s, there is still very little known about it. Thunberg first collected Apodolirion lanceolatum near Swellendam and this first specimen is now housed in the herbarium at Uppsala University in Sweden. It wasn’t until a century later that other species were discovered and placed in the new genus Apodolirion by Kew botanist J.G Baker. Superficially the genus is similar to Gethyllis, but it differs in several key ways including that its centre of diversity is in South Africa’s summer rainfall region. Apodolirion lanceolatum is distributed from Swellendam and Heidelberg eastwards to Stilbaai and Mossel Bay and inland to Ladismith and Calitzdorp where the plants are found growing on exposed rocky shale slopes in stony clay soils. Flowering takes place from December to February with the flowers having a very strong sweet scent at midday. It is not known what pollinates the flowers of this species or any other member of the genus at present. It is listed as Data Deficient on the Red List of South African Plants. This beautiful member of the genus Lachenalia is one of the only summer flowering members of the genus occurring in South Africa’s winter rainfall zone. It was relatively recently described last year by Kirstenbosch NBG bulb horticulturalist Graham Duncan. The species was first discovered by ORCT Director Dr Odette Curtis, who found and collected a late stage flowering specimen during her PhD research. It was later found again by our Reserve Manager Jannie Groenewald who realised that the plant was likely to be a new species. This was confirmed a year later from a type collection in the Kirstenbosch Nursery by Graham Duncan and then illustrated by botanical artist Vicki Thomas. The paper describing the species was later published in the journal ‘Phytotaxa’. This species is likely to have eluded botanists for so long because of its unusual flowering time, outside the normal flowering season for the majority of Overberg Renosterveld species, when there are few botanists monitoring the veld. It is known from just one locality, growing on quartz patches within Ruens Shale Renosterveld and is Red Listed as Critically Endangered. 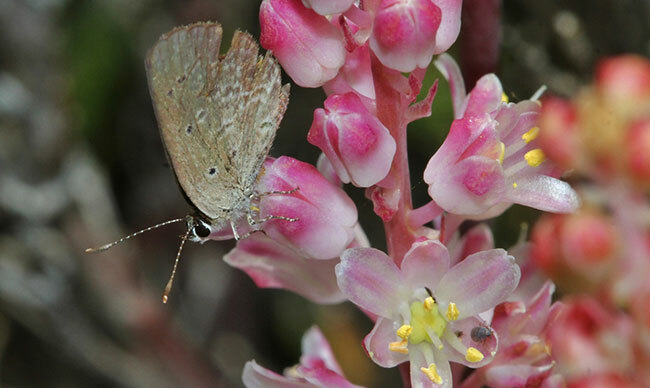 It is visited by the Small Common Hairtail Butterfly Athene definita (Lycaenidae) and a small, unidentified solitary wasp. This prickly customer is Macledium spinosum, a member of the Asteraceae or Daisy Family. It is also known as the Steekblom in Afrikaans. It is distributed from Du Toitskloof eastwards to Somerset East where it is found growing on dry rocky slopes on shale derived soils. It is inconspicuous the rest of year, flowering during the height of the summer months when little else is out. 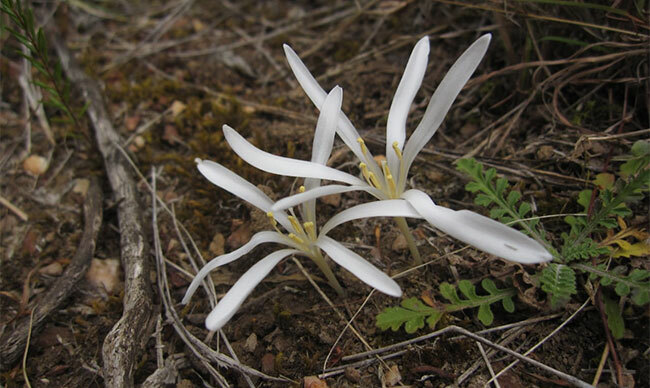 Summer is also the time of year that the beautiful white blooms of Gethyllis emerge from the dry earth in the Overberg. 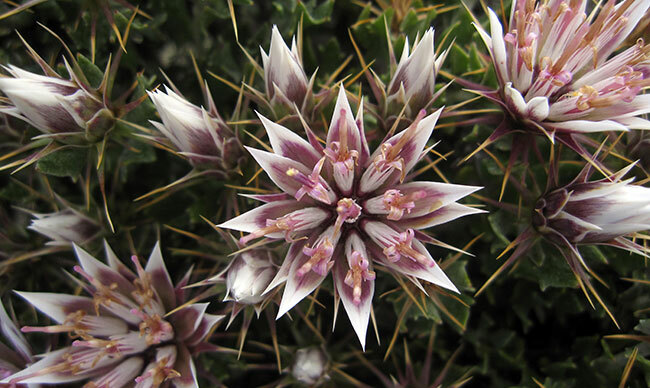 There are two different species that occur in the area: Gethyllis afra and Gethyllis villosa. They can be difficult to differentiate if only seen in flower. The genus name ‘Gethyllis’ is thought to be derived from the Greek word ‘gethyon’, meaning leek. The genus Gethyllis was coined by Linnaeus in 1737 in his Hortus Cliffortianus. It is the least well studied of all genera from the Amaryllidaceae family. Members of the genus are unusual in that they are adapted to semi-arid conditions through producing their leaves, flowers and fruit during different seasons of the year. The leaves grow throughout the relatively wet winter and spring months before dying down as conditions become drier as summer arrives. Flowering takes place during the summer months, with the flowering being triggered by a drop in barometric pressure when low pressure systems move through. The finger shaped fruit emerge during autumn as temperatures drop and conditions become wetter once more. It is not known what pollinates the flowers in this group: In 1915 Rudolph Marloth illustrated blooms of Gethyllis afra being visited by a hawkmoth, but this appears unlikely owing to the lack of nectar present in the flowers. 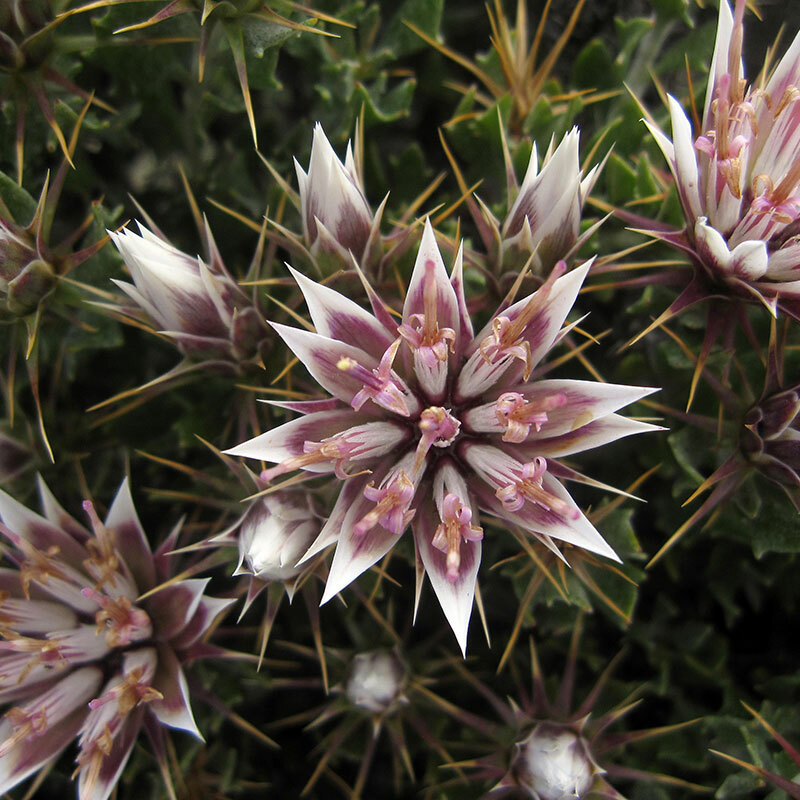 Gethyllis afra is distributed from the Cape Peninsula northwards to Namaqualand and eastwards to Heidelberg in the eastern Overberg. It grows on stony or sandy flats in full sun, often growing in colonies. Gethyllis villosa is so named because of the dense hairs found on the leaves. It grows from the Richtersveld southwards to the Cape Peninsula and eastwards to Riversdale and Mossel Bay where it grows on sandy clay or shale flats. Neither species are listed as threatened according to the Red List of South African Plants.